Innovate or perish. It’s a theme we’ve been discussing for several weeks, looking at the impacts of digital technologies on industries across the globe. Whether you’re a government agency, an industry leading corporate, or even an NGO, chances are you’re being asked to deliver more, on a tightening budget. Customers are expecting seamless, always-on service delivery. Competitors are emerging with lean operations built on modern, flexible software stacks, that are targeting the most profitable parts of your value chain. This has created a renewed imperative to disrupt internal workflows and quickly find new ways to solve problems. Effective communications can be an immediate and powerful differentiator, helping to get the right information to the right people in an organisation, at the time that they need it to solve their immediate business challenges. Streamlined communications can help coordinate staff, improve your customer experience, and help IT to become a strategic enabler of business outcomes, rather than just providing functional support. Best in breed communications suites allow these complex information streams to be managed and delivered from a single source of truth. The full power of these systems can then be realised when the underlying workflows are redesigned to fully exploit their potential, and independent sytems of record and engagement are connected automatically, typically through APIs. An introduction to the API Economy. APIs are software interfaces which provide the integrating layer between data and business logic from multiple enterprises, connected through apps on any device via the cloud. APIs allow core information assets to be packaged, shared or sold between enterprises to build awareness, increase customer satisfaction, shape services more tightly to customer requirements, and expand partner networks. APIs are helping driving much of the digital transformation across industries today - IT researcher Ovum forecast that the number of enterprises having an API program is expected to increase by 150 percent, and the API Economy will become a $2.2 trillion market by 2018. This is a key advantage of SaaS deployed capabilities, as the appropriate solution can be adopted with no development lead time, and API integration typically allows these services to connected rapidly and securely to existing systems, to leverage their functionality and data. Synchronising a SaaS Communications platform to HR data for example, and connecting the system to IT incident monitoring tools, provides a level of certainty that all staff in the enterprise can be reached in a timely way, with information relevant to their roles. Transitioning to communication automation requires rethinking traditional business processes, and creates the conditions for proactive scenario planning and innovation around operations and interactions with staff, suppliers, customers and other stakeholders. Proactive Planning for Moving to Messaging Automation. - Put People First: Too often new tools are chosen simply to have the latest technology, which conversely add to the complexity of communication. Rather than multiple point solutions, look for a platform that focuses on simplifying the user experience, without trading off capabilities or insights. - Omni-channel Messaging: Send messages to your staff and customers in the way that suits them, whether that’s voice, SMS, Social Media, Rich Messages or email, to improve the rates of delivery. Knowing they will almost always have their mobiles close allows organisations to provide messages on all these channels. Geo-location can segment communications even further, such as providing multilingual messages appropriate to the recipient’s location or pre-defined contact preferences. - Interchangeable Message Templates: Message templates should be prepared with specifics which can be rapidly altered to suit the appropriate products, services or situations being targeted, thereby saving time with pre-planned communication and response options. - Rapid Communication: When urgent communication is required, SMS accelerates the speed of notification. Whereas half of all emails aren’t opened for at least six hours, the average text message is accessed within a few minutes and responded to within 30 minutes. Voice calls to mobile and fixed lines generate an even faster response, and can be created to trigger automatically from the communications platform. - Scalability and Consistency: Look for solutions that can be scaled not only to other operational parts of the business, but can also grow internationally, and comply with regulatory requirements in differing jurisdictions. - Plan for the Future: A number of emerging technologies are converging, such as IOT and Artificial Intelligence which allow vast amounts of data and individual insights to be combined to allow highly targeted communications at scale. Mass personalisation is increasingly being expected in all forms of communication. Look for a messaging enabler that’s able to grow and seamlessly incorporate these next generation technologies. 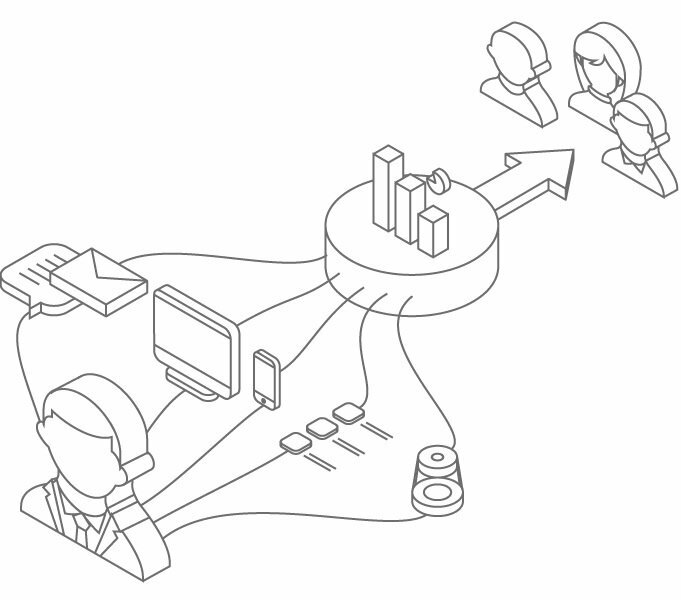 - Integrated Communications: Combining all of these communications streams into a single platform, with a central reporting dashboard improves cut-through in the delivery of messages and provides a mechanism for tracking all critical communications, giving recipients a way to respond appropriately. This allows informed, real time decisions to be made from these conversations. Digital technologies have permanently changed the playing field for global commerce, presenting business of all sizes the opportunity to be disrupted, or a disruptor. Organisations that can implement the right mix of internal and external innovation to turn information into a strategic asset are best poised to rise to the challenges of this new digital age. To read more insights into digital fitness, check out our Operational Communications Handbook. It's your complete guide to the growing role of best-in-breed communications technologies in fundamentally transforming business models and operational processes, to stay competitive in the Digital Age. Download your free copy in the sidebar.